FILE - The head of Alfa Bank, Pyotr Aven, is pictured at a news conference in Moscow, Russia, July 18, 2016. The Kremlin on Thursday said that Alfa Bank principals were not representing interests of the Kremlin or President Vladimir Putin at a recent closed-door meeting with the leadership of a major Washington think tank. VOA reported Wednesday that the Atlantic Council hosted an off-the-record round-table dinner for two oligarchs listed on a U.S. Treasury-issued registry of 210 wealthy Russians identified as close to Putin, which was published in January. The private event, which was internally billed as an open-ended discussion about “the Russian economy in an era of escalating sanctions,” featured billionaire bankers Pyotr Aven and Mikhail Fridman of the previously U.S.-sanctioned Alfa Group, Russia’s largest private lender. FILE - Mikhail Fridman, chairman of the supervisory board of the Alfa Group Consortium, attends a ceremony at the Moscow Exchange in Moscow, Russia Feb. 1, 2018. Aven's and Fridman's attendance drew criticism from a dozen prominent anti-Kremlin thinkers and activists, who published an open letter condemning the event as an ethical breach. Atlantic Council officials, who have routinely hosted or cited the work of signatories to the critical letter, pointed out that all Alfa principals were removed from an updated list of Russian billionaires targeted by U.S. sanctions. 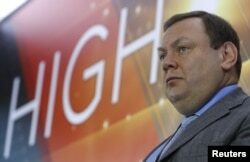 Kremlin spokesman Dmitry Peskov said Thursday that Aven and Fridman were representing their own business interests. Both men are named in the controversial Steele dossier, which details alleged connections between President Donald Trump's election campaign and Kremlin operatives, and both men are named in CAATSA, the U.S. sanctions law tied to allegations of Kremlin interference in the 2016 U.S. presidential elections. Neither was ever sanctioned individually, and both have filed multiple defamation suits over being named in the Steele dossier. Despite Alfa Group’s well-established ties to Putin — Aven openly acknowledges a friendship with the Russian president that spans decades, and Reuters has reported that children of Putin and Russian Foreign Minister Sergey Lavrov work for his company — the Alfa principals were notably absent from the updated list of Russian entities sanctioned by the U.S. Treasury on April 6. Ekho Moskvy radio on Thursday cited unnamed sources familiar with the Atlantic Council talks, who said that that Aven and Fridman predicted Russia’s economy would continue its decline despite high oil prices, largely as a result of “irreversible structural changes” and brain drain. Aven and Fridman have a combined estimated wealth of nearly $20 billion.